llow us to introduce ourselves. We're Plymouth. A car company reborn with clever ideas. Like Prowler, a concept car we're actually bringing to production. And especially like the convenient options we're giving you to shop for our products. There's Plymouth Place by Phone, a toll-free information center staffed with smart, friendly advisors. And Plymouth Place in the Mall, a pressure-free traveling showroom at sites across the country. 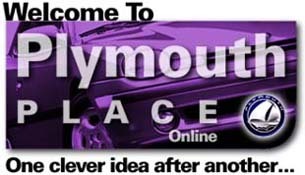 Then there's this site, where you can build the exact Plymouth you want, complete with its price. Should you become a Plymouth owner, you'll discover the commitment of Chrysler Corporation and a special program called Customer One. It's all here. A fast and easy way to get exactly the information you want, while learning about the meaningful innovations in our vehicles. In the end, that's probably the most clever idea of all. About this Web site: This Plymouth Place Web site provides product and promotional information about Plymouth and its products. The information contained in this site is ©Copyright and may not be distributed, modified, reused, reposted, or otherwise used outside the scope of normal Web browsing without the express permission of the Plymouth Division of the Chrysler Corporation. Since the date of last programming, some Web site information may have been updated, and may be subject to specific requirements or availability. Some of the equipment shown or described throughout this Web site is available at extra cost. Chrysler Corporation reserves the right to make vehicle or pricing changes from time to time without notice or obligation. See your dealer for complete details and the latest ordering information. Although descriptions are believed to be correct, accuracy of this site, or any outside links cannot be guaranteed. All specifications, descriptions, and equipment identified in this Web site are specific only to vehicles offered for sale in the United States. All prices and pricing information identified in this Web site are quoted in U.S. dollars, and are specific only to vehicles offered for sale in the United States. ©1996 Chrysler Corporation. All Rights Reserved. This Web site also contains images Copyright©1996 PhotoDisc, Inc.